After trying and failing to launch a competitive music streaming service for years, Google released YouTube Music last month. You might’ve thought Google’s latest attempt to compete with the likes of Apple Music and Spotify would’ve pushed forward with new ideas. Nope. A quick browse through the app reveals that at the moment it’s simply a lackluster Spotify clone. While not exactly billed as such, YouTube is already the most popular music streaming platform on the planet with over a billion users, many of whom use the service as their default way of playing music online. With YouTube Music, the company is desperately trying to convince you to pay for that same access. Lyor Cohen, YouTube’s global head of music, said earlier this year at SXSW that the path to get you on board with subscribing was to “frustrate and seduce” with aggressive advertising and limited free functionality. His press tour offered no vision of exciting new features that would make you want to sign-up for another music streaming app. When you launch the new YouTube Music app, the opening screen pushes new releases, your own listening history, recommended music videos, and contextualized recommendations based on factors such as location or time of day. Lifting the Spotify aesthetic might have been forgivable if YouTube Music built upon its competition’s feature set, but instead, YouTube brings almost no new ideas to the table. Even YouTube’s curated playlists mimic Spotify: RapCaviar on YouTube is Rap Star Status, Clout Culture becomes Clout Rising, and Viral 50 morphs into Blogged 50. YouTube Music’s endless library of music videos is nice, but that isn’t anything new for mobile YouTube users. There are no novel ways to experience the music, and no new possibilities of how songs and videos can interact. Elias Roman, a product manager for YouTube Music, said in an interview with Gizmodo that YouTube is testing a feature that would allow for a seamless transition between songs and videos. That feature may sound enticing, but Roman provided no timeframe for when it might arrive. It’s the kind of idea that could help justify another monthly music subscription fee—a justification YouTube music currently lacks. For now, the service is simply YouTube plus Spotify, which in 2018 isn’t enough. In March, YouTube hired Tuma Basa, the man behind Spotify’s most popular playlist, RapCaviar. 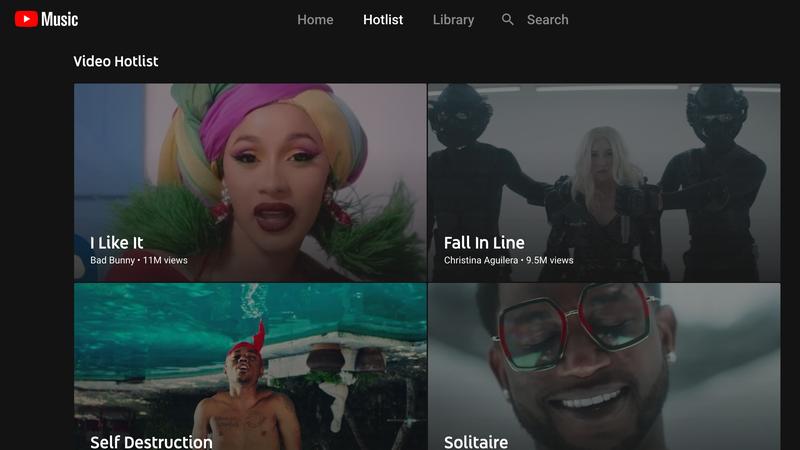 The hire signaled the company was ready to further invest into curated playlists and content; however a YouTube spokesperson said Basa right now isn’t directly working on the new streaming service. Although YouTube has done original video with artists like Demi Lavato, there is no Apple Music Beats 1 radio-equivalent or any other official content by known curators and musicians currently on YouTube Music. The lack of an original, curatorial touch—like artist-curated playlists or interviews—makes it harder to justify a YouTube Music subscription. But there is one bright spot that could have won us over: YouTube’s decade-plus supply of user-created material. As a music nerd who constantly uses YouTube to listen to music, this range of diversity is exactly why I often turn to YouTube over Apple Music, Spotify, or any other number of music platforms. The most compelling part of YouTube Music is how the service combines millions of officially licensed songs with remixes, covers, and many other forms of user-created content. YouTube is full of out-of-print records and DJ mixes that are the exact kind of music that can’t be found on most platforms, like the early rap track “Funk Box Party 1" by the Masterdon Committee. That I can put such niche music on a playlist next to the latest Bruno Mars single is part of what should have been so exciting about YouTube Music. Unfortunately, YouTube Music doesn’t yet offer any new ways for users to collect and curate the content that sits on its servers. The browsing and search tools are fairly limited (no decade, genre, or musical style options) and there aren’t any unique ways to approach playlist creation. Google Play, whose users will be folded into YouTube Music, currently lets users upload music to the cloud and play it alongside tracks they stream. Roman told Gizmodo that YouTube Music will also gain that same feature down the line. That’s good news for users who, like me, still clutch their MP3s and want them right beside their favorite videos. However, the current song categorization options are limited to saving albums and playlists, or liking tracks—neither of which is an efficient way to categorize your favorite music. Frequent YouTube users may not have a problem figuring out what to do, but the service will be unwelcoming to many of YouTube’s billion-plus users who may have otherwise been interested in a new music streaming experience. YouTube made other poor choices. In the new app, mobile background listening is hidden behind a $10-per-month paywall. This effectively makes the free version of the service unusable unless you’re fine with not actually using any features of your phone while listening to music. On desktop, YouTube can get away with this, because you can simply tab over and you aren’t locked to this single screen for music consumption. By contrast, Spotify’s free service allows background listening. Not being to multitask while listening to music undermines the point of the free mobile app. There are some features coming down the line that suggest YouTube does understand its users. One of the biggest channels for EDM on YouTube is Trap Nation, but if you search YouTube Music for it today you’d never know that; there is no creators’ page or anything to distinguish people who put effort into curating their channels to promote or support themselves. Roman mentioned that curator and channel-specific pages will come to YouTube Music, but again offered no specific timeframe. It’s just frustrating that such options aren’t already included on the service. Broadly, YouTube Music feels like a low-effort attempt to convince you to pay for music on a platform where, for the last decade, you’ve gotten just about everything for free in exchange for watching ads. Given how useless the free version of the app is, it seems the only way YouTube wants users to experience its music service is with a paid subscription. That’s a tough sell, because YouTube Music doesn’t really offer anything you can’t get somewhere else.